Operators: Borodyaev U., Leongardt U. City of Kiev. 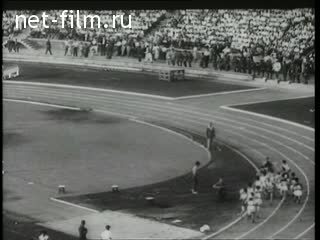 Superiority of the Soviet Union in athletics. Winner of races - J. Press, P. Bolotnikov. Italy. City of Rome. 1957. Soviet athletes V. Kuts, P. Bolotnikov at a distance, on a pedestal. City Lutsk. -Union competition weightlifting sport in rural communities. City of Moscow. Stadium Builder ". Moments of the rugby match between the teams of the Moscow Aviation Institute and the Moscow Higher Technical School im. Bauman. Stadium "Luzhniki". The final game of Cup football between the teams "Torpedo" (Moscow) Dinamo (Tbilisi). Germany. City of Leipzig. XIV Chess Olympiad. Team receives the USSR Cup, among athletes: T. Petrosian, V. Smyslov, M. Botvinnik, Tal, M., V. Korchnoi.